Hello, and a joy-filled mid-July to you! Welcome, or welcome back, to my newsletter. 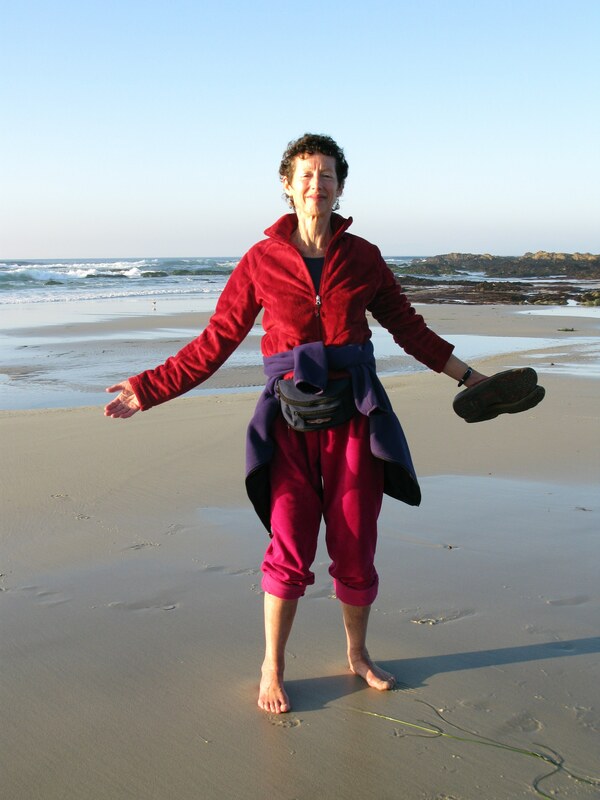 In the photo above I'm on a windy Pacific beach in December. I chose it for those experiencing true beach weather now, like we have in NY, and also for those readers in the southern hemisphere who are in mid-winter. No matter what the weather, you can still dip your toes in the ocean, and recharge your battery with Nature's energy. Today's issue has an article on investigating the characters in your dreams more closely, and one on revisiting past newsletters. Enjoy! Dreams: Who are you dreaming about? Sometimes my dreams feel like a familiar neighborhood, where I usually see the same people. There's my beloved departed Dad, or one of my favorite teachers, or that guy I dated in college. Who shows up in your dreams can give you a clue about who is on your mind, or can point to a solution to a current worry, Or maybe you will be led to take some action, like contacting that old friend you haven't seen in a while. My dream teacher Robert Moss says that departed loved ones often appear in our dreams, and that they're right here, no farther away than the edge of a maple leaf. 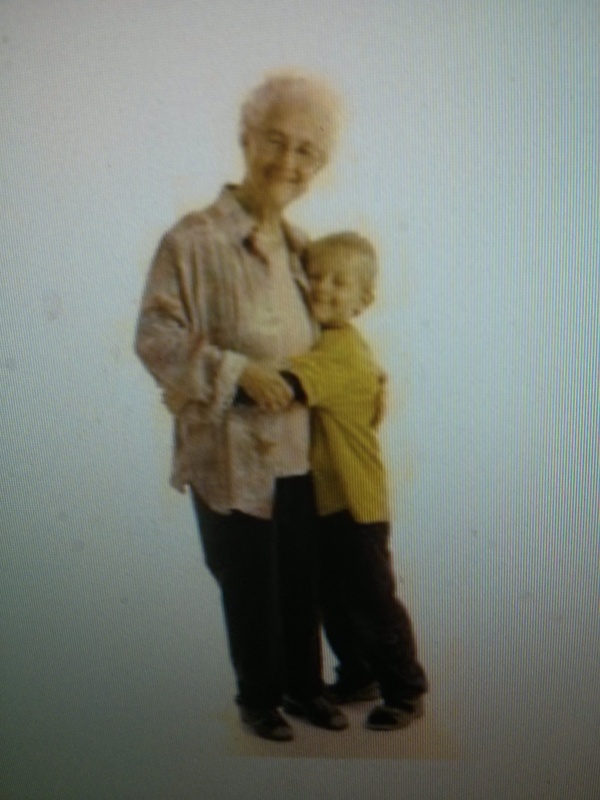 So perhaps that dream of the grandmother who always gave you cookies as a child, and soothed your hurts when everyone else seemed too busy, means she's still there to comfort you now. What would she do if she were standing next to you? Can you do that for yourself? If you often dream of a child, it is possible this is your younger self tugging at you. Maybe he wants you to be more playful and stop working so hard, or she wants you to speak up to your bully boss like she couldn't to that mean teacher. Or the child could be showing up to remind you of what you really love to do, not what Society says you should do. See if you can do it now. It's never too late! Some schools of dream work say every dream character is a piece of the dreamer. So could that angry tyrant, or the hero who saves the day, really be you? Try journaling a bit about who appears in your dreams, to see whether anyone reminds you of yourself. And if so, do you like this person, or not? If not, changes might be in order. If you want to understand your own dreams better, consider a Dream Coaching session. All that wisdom is just waiting there to be discovered, and used. Mine the gold from past newsletters! If you've only started reading my newsletter recently, or you skimmed over an earlier issue, you may want to review some of the past ones. You'll find many articles about vision, dreams, and EFT, and the index makes it easy to locate what you want. You can see all past newsletters here. Happy perusing! 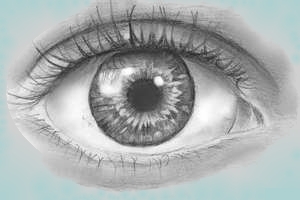 Although I've written numerous articles about vision improvement, everyone's eyes and visual brain are unique, with unique strengths and challenges. If you'd like to learn more about your own seeing, and how to improve it, consider a personal Vision Coaching session. Wouldn't you love to see more clearly and easily? 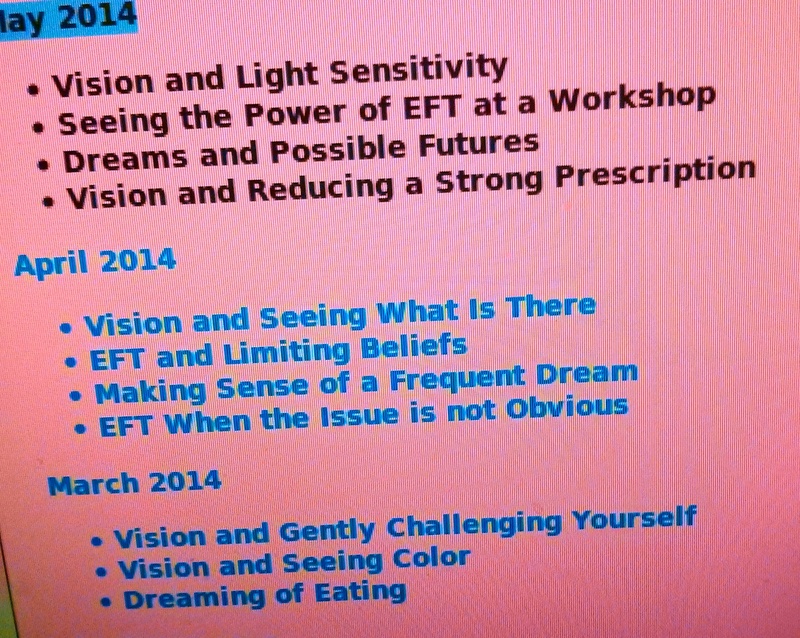 Let me know what you've wondered about concerning vision or dreams or EFT. I'll be glad to write a short article addressing that topic. Thank you to those who have sent me questions, or see a question you asked me in a private session written about here. You're helping many other people! Enjoy the rest of this joyous month of July. I'll write again in a couple of weeks. Take care!